This story was originally published by First Languages Australia in Warra: Building teams, building resources. People across the region can hear the language, simply by tuning into ABC's Coffs Coast morning radio show. Each Wednesday, Gary Williams, a Gumbaynggirr language teacher at the Muurrbay Aboriginal Language and Culture Co-operative, a regional language centre working to support the languages of seven Aboriginal communities in NSW, teaches words and phrases to listeners and to the show's presenter Fiona Poole. The 3-minute segment airs at 7:30 am after the news broadcast. 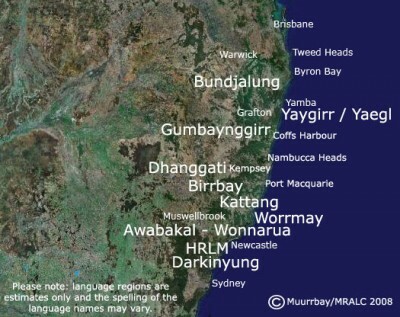 Map of the Many Rivers language region of NSW, Australia. Photo: Muurrbay Aboriginal Language and Culture Cooperative. The Gumbaynggirr radio segment began when Poole approached the Muurrbay co-operative, hoping to start local language lessons on the radio. Muurrbay referred her to Williams who had previous community radio experience. Williams was interested but aware that a long language class on the radio would not engage the general public. Together he and Poole decided on the 3-minute format. Each week Williams chooses a few useful words or a phrase to share with the radio listeners. The program is spent in casual conversation teaching Poole the words and explaining their use, context, and detail. He says that the program has a diverse range of listeners, both Gumbaynggirr and other local people. It is great to turn up at local events and have people I have never met before recognise me and then greet me in Gumbaynggirr. There is increasing interest in our language across the region and the program allows people to begin a conversation with Gumbaynggirr and other Aboriginal people in the region. 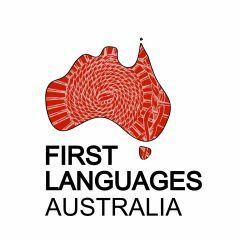 This is how reconciliation starts.Though in some areas of Australia communities do not wish to teach their traditional languages to people outside their communities. Gumbaynggirr community members have never raised concerns about having their local public learning the language in this way. Gary says the community has a lot of trust in the language centre and generally supports the projects it promotes. The Gumbaynggir radio segment has been running since 2011. It continues because of the dedication and interest of the two-person team; however, the simple format allows other people to step in as necessary if they are not available. For those unable to tune in each week, the new words and phrases are also made available online on the ABC local blog. The blog links to audio of Williams saying the phrase and its translation. For those wanting the full three-minute version, one has to tune in to the radio show, as the blog shares just a short clip from the show. The language isn't just being taught on the radio. Though there are pockets of people who have grown up with the language, Gumbaynggirr lessons are also given in schools and community programs by dedicated teachers such as Michael Jarret, whose hope for his language are documented in the ABC OPEN film posted above. The radio collaboration has proven to be an excellent way to promote Gumbaynggir and the work of the Muurrbay Aboriginal Language and Culture Co-operative across the region both to radio listeners and internet users.